Abundance is not the word I'd reach for when describing the past year's veg successes. It's been more a little taste of this and that when the weather has obliged. In choosing my 2012 veg, I envisaged a nice prolonged warm summer (like last year) with the right conditions for tomatoes, chillies, sweetcorn, squashes, courgettes and exotic pulses such as LabLab beans and purple podded peas. Foiled (or fooled?) again! My sweetcorn grew but the cobs didn't fatten, the fennel has seeded itself all over the garden thanks to high winds, peas and pole beans amounted to nothing much. On the other hand, the Canadian Wonder (red kidney) beans that I ordered have been a triumph; they produced a huge number of slim pods over a long period so that I had plenty to give to friends and neighbours. I picked the pods young (about 3 - 6 inches long) for eating - they were delicious. 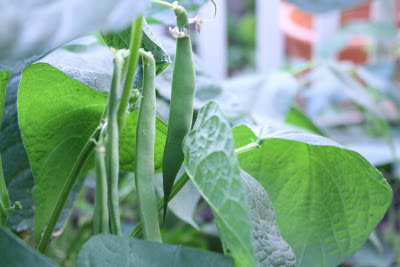 I had hoped to grow several plants for mature pods so that I could save the kidney beans over winter (I love a good bean stew or chillied beans) but it didn't happen. I guess much more warmth was needed for that. Most of my courgettes rotted before they grew much more than a few inches high - apart from the Sicilian Long White on my balcony :) but a spaghetti squash planted close to the wall struggled through to September when it was rewarded with a few weeks of warmer weather. That did the trick nicely and it went on to produce several huge squashes, the biggest weighing nearly 3 kilos, probably enough to feed at least 6 people! Is that a big achievement? It certainly felt like it to me. I chose this vegetable purely for it's name - Striped Squash Pyjamas. Sometimes a total lack of logic is best. My tomatoes were very deliberately chosen - Sub Arctic Plenty. Touted as fruiting within 9 weeks of planting and being able to set fruit in cooler conditions, surely this was the tomato for me! It didn't, however, live up to expectations, producing only a couple of dozen tomatoes between the 2 surviving plants - and those after several months of nurturing. I blame the weather. It's a lovely looking tomato though, like a small beefsteak and with a very good flavour, thin-skinned and lovely squiggly insides - I'll be growing this one again in 2013 and hoping the weather is kinder. (All my veg are grown outside and at the mercy of whatever the weather may thrown at them.) Incidentally, the other two seed choices, Red Alert and Principe Borghese, either didn't grow or didn't fruit. What a year! I also had a bonus tomato plant in the patch, grown from the seed of one of last year's dropped Cherriettes of Fire tomatoes. This time, knowing its dendency to droop, I potted the little found plant into a large pot where it flourished to produce lots of very late mini tomatoes. Even now in November, I'm still able to pick a small handful from this plant although it's now on the way out. So what about next year? I'm thinking only about the vegetables I buy in quantity: purple sprouting broccoli, beans, squashes, beetroot, blueberries, raspberries and, of course, plenty of herbs and edible flowers. Potatoes break up the soil and carrots take up very little space if grown in tubs but both are cheap to buy, as are onions (but I've already bought white onion sets). I'll grow lots more salad leaves on my balcony (far far away from those pesky slugs!) and broad beans (red flowered, hopefully) as they get the season off to a good start. As to varieties, I'm already reading through the catalogues to see what's new, thinking about weather protection for my crops and dreaming of a greenhouse. Putting aside my liking for the songs of Lou Reed (amazing how these things resurface when needed! ), I promised the results of my trial of Rosehip Jelly and will throw in my Rosehip Syrup for good measure. I'm finding both invaluable at the moment for warding off colds and winter ailments as rosehips are believed to contain considerably more vitamin C than just about any other food you can think of. I've made rosehip cordial before but not jam/jelly. I found it quite confusing sorting out the ratios of hips to apples and sugar; it seemed that every recipe I found called for something different. The recipe that first got my attention was in the October issue of 'Grow Your Own' mag. They call it Rosehip Jam and use twice the weight of rosehips to apples plus lemon juice. Apples are needed for their pectin to get a good set. I also had a day out at RHS Wisley (wonderful, wonderful); a quick look in a foragers' recipe book there contrarily recommended using twice the amount of apples to rosehips! Across a range of recipes, sugar quantities varied, as did method. I discovered that the Wisley recipe was the same as one used by the Women's Institute and so plumped for that one. Reading the method might put a few folk off but it's really not too tricky. It was hard trying to discover how much of the hip to chop off before pulping. I settled on making the effort to wash, top and tail every hip, taking off just the very tips and being careful when removing the thorny stalks. Seeds are left in and the hips are ready for whichever recipe is being used. By cutting the hips, vitamin C starts to be lost so it's important to process the hips quite soon after picking. A large saucepan will do just as well as a preserving pan - I use a 4 litre stockpot - but it must not be iron or aluminium as this will destroy the vitamin C and turn the hips black! I also don't have a jelly straining bag; instead I use muslin squares but a tea towel would do as well, as long as they're washed and ironed well to sterilise the cloth. Jars can be sterilised by washing and put straight into a warm oven (150C) to dry for about 20 minutes, the lids should be boiled for about 5 minutes. I strain the boiled pulp by placing a muslin cloth in a large sieve, pouring the pulp in, then gathering up the corners and tying them firmly through the handle of one of my wall kitchen cupboards in order to raise it above the bowl underneath. This is then left to drip for at least 2 hours, or overnight. Various recipes advise not to squeeze the pulp bag to extract the last bit of juice as this makes the jelly cloudy. Well, I couldn't help myself as I don't like waste and my juice cleared when I added the sugar at the jam making stage so I wouldn't worry about that! It might seem a faff but it's easily done in an evening and you have a delicious jelly that can't be bought in the shops! Rosehips have a very subtle flavour and the finished jelly is delicious on toast. Chop the apples and put in the pan, seeds and skin included. Add the topped and tailed rosehips. Cover with water so that the apples are just floating, bring to the boil and simmer until the rosehips are soft. (This can take anything up to an hour and quarter.) Stir occasionally and squish down with a potato masher to help break up the hips. Strain the pulp through a muslin cloth into a bowl, leaving to drip for at least a couple of hours. Gently squeezing the bag at the end will probably release quite a bit more juice! Carefully untie the bag and throw the pulp into the compost. Pour the juice into a jug to measure it. Work out how much sugar should be added (see ingredients). Put sugar and juice into a pan and heat gently to let the sugar dissolve completely. Bring to the boil and leave on a rolling boil (like jam) until a set is reached. This is likely to be around 15 to 25 minutes. Test on a cold saucer (put a couple in the freezer before boiling up the juice) by putting a teaspoonful onto the cold saucer, leave for 2 minutes and run your finger or a spoon through the jam. If it wrinkles slightly, the jelly is at setting point; if not, continue boiling for another 5 minutes and test again. Skim the mixture and pot up into the jars as soon as ready. Carefully (so's not to burn fingers) put the lids on and they will seal tight while the jelly is setting. Leave to cool before labelling. The jelly will last unopened for several months or for a few weeks once opened. I had 2 small jars and one jam jar from this recipe. 900g Rosehips, 450g apples (or 600ml apple juice), Juice of 2 lemons, water, sugar. The lemon juice is added to the strained juice; 350g sugar is added for every 600ml of juice. Take 1 kg of rosehips, remove stalks and toss into a food processor. Chop briefly. Add hips to a pan containing 2½ pints water. Bring to the boil and boil, uncovered, for 20 minutes. Strain through muslin (as before) for at least 2 hours. Reserve the juice and add the pulp to the remaining 2 pints of water. Bring to the boil and boil for 15 minutes. Strain through muslin. Put all the juice into a clean pan, add 1lb of sugar and heat gently until sugar has completely dissolved. Bring to the boil and boil for 10 minutes before decanting to warm, sterilised bottles. And the "Sloe" in the post title? Well, I've just read of a quick method of producing Sloe Gin in time for the winter festivities, providing your hedgerows still have any sloes (mine don't). Follow this link to Vergette Gardens who has discovered a vintage handwritten recipe in an old gardening book which, in my opinion, gives it an excellent provenance! My own sloes were picked and washed at the beginning of September, put into the freezer to emulate several frosty, skin softening nights, then pricked and put in a Kilner jar. Sugar was added until it came half way up the fruit then vodka poured in until the jar was full. Sealed and put into a dark cupboard, I give it a little shake about once a week. It should be ready by December but will improve on keeping. Nigel Slate recommends adding a splash to your cooking; for example, apple and plum crumble or even gravy it perked up with this. On the other hand, you can always just drink it! Lovely is as lovely does. Sophie - she of the prize winning pumpkin - chose to share her Fortnum's hamper of sweets amongst family. She has 6 cousins and a sister so sharing her success would have made a sizeable dent in the chocolate booty but she also included me. Having an elder sibling has meant learning to share and little Sophie seems to have taken that on board in spades. How refreshing in this day and age of over-indulged, instantly gratified children. I love my family all the way to moon and back... and not just for chocolate (obviously). We've done it again! 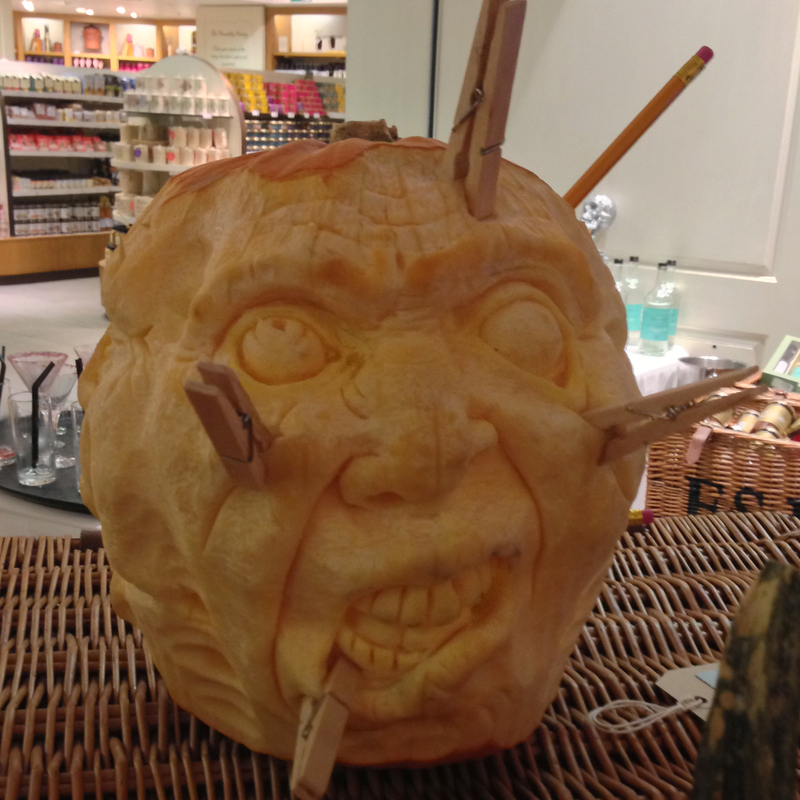 Fortnum's pumpkin success! 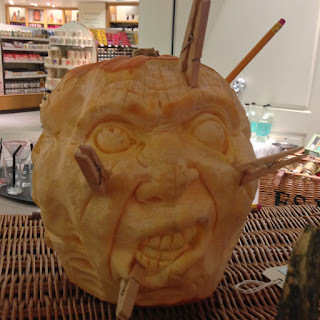 This Hallowe'en I couldn't make it to the annual Fortnum & Mason pumpkin carving competition as I was working a long day but my sister's Midlands-based family made the effort and trekked down to London for it; I joined them for the last couple of hours in the evening. A couple of years back, my niece Kate won the inaugural competition, coming home with a bespoke besom broom and the promise of a Fortnum's delivery truck dropping off a £1000 hamper at her door. Last year, my great niece Lottie (then 7½) scooped the top award for her entry into the children's section - her winning pumpkin was featured in Fortnum's publicity for this year and she took home a sizeable selection of Fortnum's sweets in one of their famous hampers. So, no pressure for this year then... To be honest, the bar is now set so high, with very seriously competitive entries from professional pumpkin carvers, that it would be (almost) impossible for the hobbyist to win in the adult section. The 2012 adult winner: 3 gruesome faces carved around the pumpkin. Makes me think of the first Harry Potter film! Thank goodness, then, for the children's section where, yet again, the winning pumpkin was chosen from those entered by members of my family - this time by Lottie's younger sister, Sophie (6½). Her sister and cousin were also commended for their efforts. 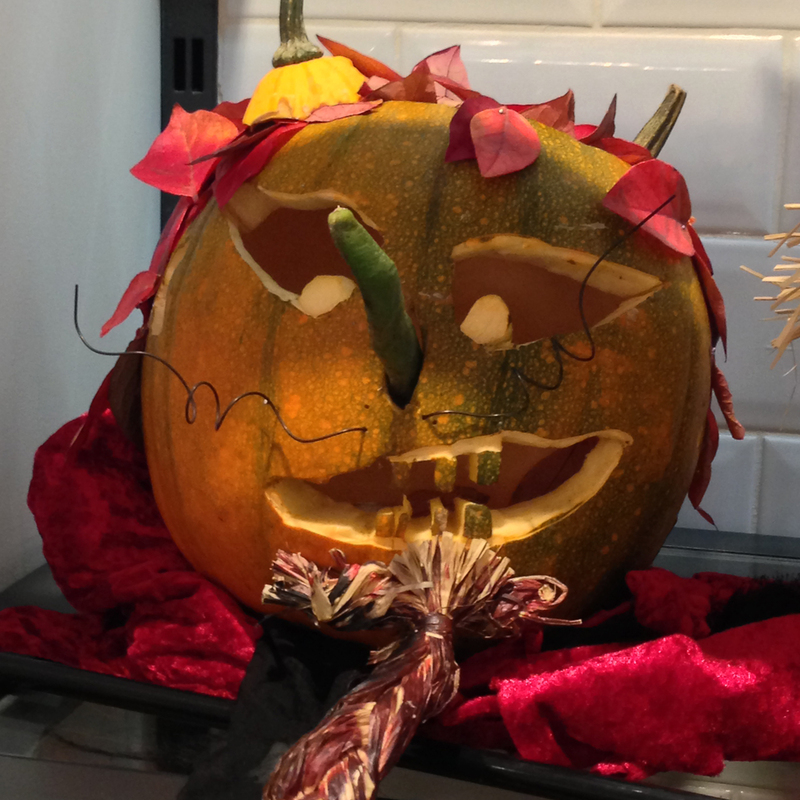 In case you can't immediately see it, this is a devil-faced pumpkin with flames, plaited raffia beard and (slightly slipping) horns - and, in my humble and totally biased opinion, much nicer than the adult winner, retaining a certain charm and friendliness. I was very thirsty after my day at work so avoided more than a sip of the blood-coloured vodka and blackcurrant purée in favour of the non-alcoholic thirst quenching blackcurrant purée and soda. Hmmm, it was all so lovely that I'm now wondering about slipping along to the macaron making demonstration this afternoon! Autumn harvest - squashes, late ripening tomatoes, foraged rosehip jelly and syrup. It's late Autumn, things are supposed to be slackening off but this year continues to rush by; there's lots still to do and it seems to be getting harder to spare the time to just sit still and write for the blog. Bad time management? Or maybe not; there's almost too much going on at the moment which makes it hard to find the time to gather my thoughts into a newsworthy post. I'm also feeling the lack of time to read my favourite blogs so apologise for the lack of comments, both here and elsewhere. My intention is to catch up with several short posts but, for now, I can't wait to share the news of my good fortune. 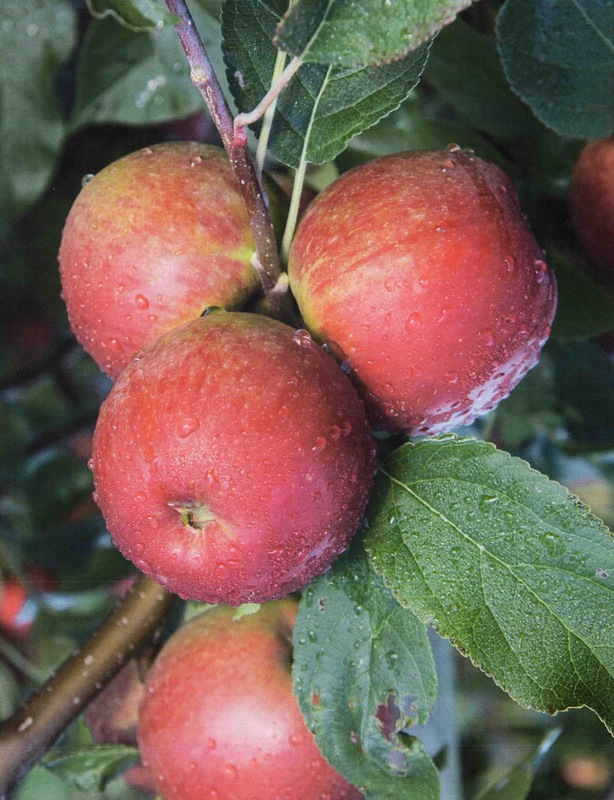 The London Orchard Project have developed a new apple variety specifically for London, the first since 'Merton Delight' was introduced in 1953. It's been 10 years in the making, is yet to be named and the first 100 trees are now almost ready to be planted ... and I've just been told that I'm to get one of those trees for the gardens here. I'm thrilled - but also wondering what rootstock (if any) it's grown on and what the maximum height may be. It's going to be a flavoursome, crisp apple, developed from a cross of Laxton Fortune and Pixie, both of which have strength and good disease resistance. My tree will be planted in December; I just have to pick the spot. Carefully. Previous trees have grown tall and leaned into the sun's path. There's also the not insignificant matter of ancient water pipes under the gardens; these days, nobody's too sure where they are. So, careful thought is needed. Any London-based readers who fancy growing one of these apple trees should check out this page on the London Orchard's website and suggest an appropriate name for the apple - either by tweeting or email. On a completely different note, I've also won a portable barbecue from Notcutts! I can't remember how I came to enter this one as I rarely bother with competitions but, there we are, a lovely cream barbecue duly arrived, ready for use next summer. I'm hopeful that there WILL be a summer next year and am already planning a new layout and planting for the garden in my head! My favourite image from last Friday's course: The Castor Oil plant (Ricinis communis). So, back to Capel last Friday and this week we got going with the good stuff. Plant identification builds week on week so that, with practise and a well-exercised memory, my fellow students and I should be able to confidently - and correctly - identify at least 150 plants with their Latin names by the end of the year. Sounds quite a task to me but I imagine that most of us gardening folk know quite a few plant names already without realising it. Or maybe that's just me being a bit of a plant geek and having a penchant for being able to spout the Latin names of my favourites; I find it helps to monitor how many of my brain cells have apparently died; I frequently find a complete void in my memory where peoples' (and plant) names and significant events used to reside. This week another 8 plants have to be instilled in my memory bank before next Friday. It's said that the best way to learn is to use several senses at once: students get walked (in all weathers) through the maze of gardens to the relevant plant, told all about it (type, aspect, soil, habit, role in the garden, features, etc), have a quick line sketch and/or photo, touch the plant (well, I do) and - whoosh! - onto the next one. I was so absorbed in sketching the Sedums that I momentarily got left behind and lost the group, thereby missing out on fascinating titbits about Japanese windflowers. The rest of the morning was spent having our eyes opened as to the meaning of plant names, how and why they're constructed (grouped) and a short potted history of the Binomial naming system. The tutor is excellent - and, believe me, I've sat through some real duffers. She's friendly, passionate, interesting and interested; pretty much what's needed to get the message across. Abelia x grandiflora (a bit of a misnomer as the flowers are tiny!). Domed shrub. Macleaya microcarpa 'Kelway's Coral Plume'. Large perennial. Stipa gigantea ... as the name suggests, a large grass with golden oaty plumes. The afternoon was equally absorbing; we spent much of it drawing upside down! (Not the students, the image. I had a sudden mental image of 15 students hanging, bat-like, from the rafters with pencils in hand!) It's a creative technique to get the right side of the brain to dominate during sketching activities - or, as I would call it, walking before you can run. It's taken from the book "Drawing on the Right Side of the Brain" which has spawned a decade of workshops in New York. I had a quick look at their website and, especially, the 'before and after' gallery, from line sketch to tonal sketch with most of the self-portraits seemingly of desperados from a John Wayne Western! Luckily, for homework, we can have a go at doing our line drawings the right way up! It's another dry day here in London so I'm going to spend a couple of hours in the veg patch - my spaghetti squash has formed another 2 fruits, only 4 inches long at the moment, and growing among the branches of the plum tree. If these grow to maturity that will make FIVE spaghetti squashes! I've had another Sicilian courgette from my balcony plant but the peppers are struggling - I'm likely to bring those indoors to ripen up. I keep having to remind myself that the green pepper on my balcony is really an Orange Bell pepper! If I have time, I also need to remember that NOW is the time to be planting bulbs for spring, as well as broad beans, onions and spring onions, and a host of flowers for an early display next spring (marigold, cornflower, nigella, nasturtium). I've had the first of my seed catalogues (Thompson and Morgan) so I should be thinking about what to grow next year; how about everyone else? Keen to put this year behind you and plan for next year? I read the recipe for these pancakes on the Lavender and Lovage blog a few days ago and immediately thought that a batch of these, warmed through before leaving, sandwiched together with honey and eaten with fruit, might be an ideal portable breakfast. I've just made a batch (10 pancakes) and can report that they're easily made and delicious! Because I'm currently watching my weight (so I really shouldn't be eating these at all! ), I made these with skimmed milk and used a spray oil in the pan rather than butter; both worked well. The batter is mixed with oats (for energy)and Manuka honey (immune system booster). Eaten plain, there's a hint of sweetness from the Manuka honey; eaten with crème fraîche or Greek yogurt and fresh fruit, they're both tasty and filling. With more time to spare, I bet they'd be just awesome with bacon and a poached egg (and the latest gardening mag to read). The test will be how well these re-heat tomorrow morning (even I can't make pancakes at 6.30 a.m.). Undoubtedly they'll be better freshly made but needs must. Hopefully this post will strike a chord with others having to dash off first thing in the morning, not least my teenager. My thanks to Karen for sharing her recipes with the internet! Now, at last, for some gardening! What a week for a holiday at home! ~ Before the stormy weather, a view of my little veg patch garden taken ten days ago. I've taken a few days off work this week, mainly to give myself the time to have a tidy round the veg garden, clearing, pruning, sowing (broad beans, flowers) and planting bulbs (tulips, daffs, onions). I'd anticipated pottering in warm sunshine. Well, that didn't happen, did it? Not that I'm complaining: I've seen news reports of floods in the North and photos of the terrible damage all these storms have wreaked. I hope that gardening friends across the UK have made it through without the trauma of having their homes and gardens damaged - the worst I've experienced here in London is the loss of tall sunflowers (literally snapped in half) and 48 hours of rain which started last Sunday. Luckily, the day before the deluge, I decided to start digging up the spuds growing under the fruit trees. These potatoes prove that there is such a thing as a free lunch: I didn't plant even one of these, they're all left over from the first batch popped in the soil in 2010! It seems there will always be one little tuber left behind to grow on next year. There were no markers but they're easy to identify: these are Blue Danube, a maincrop potato with good blight resistance, vigorous and with pretty purple flowers. Last year the potatoes were small and I boiled them. Not good as they fell apart in cooking. Apparently, they're best roasted! Or sautéed. Or baked, which is just as well because this year, having left them in the ground for a good while, I've had some whoppers. I'm hoping for some better weather later in the week as I really want to get my bulbs in. There's also a good post over at Garlic and Sapphire about which flower seeds can be sown now in order to get a head start on the flower cutting garden next spring. But, if the weather doesn't cheer up, I can practise my plant sketching. My garden design course requires that I learn four plant idents by this Friday; the rest of the first day was all introductions, student handbooks, library visits, cups of tea and where are the toilets! So far, my heart is still in the kitchen garden and I was glad to get back to my veg patch for some thinking space at the end of the day. I think we were started off gently as the plants to remember are all fairly common: Rudbeckia fulgida (Black-eyed Susan), Echinacea purpurea (coneflower), Verbena bonariensis (Vervain; a favourite at Chelsea last year) and Penstemon 'Firebird'. The first task on Friday morning will be to collect a pre-cut sample flower and sketch it. It's been a while since I wielded a pencil so I'm getting some practise in beforehand and the rainy weather is perfect for that! To end with an uplifting image: this bed of salvia and lavender signposts the path between the graphics studio and the tea room in the Capel Manor gardens - no getting lost with this bright splash of colour! I'm noticing conkers lying on the ground, hips ripening in the hedgerows and seed pods forming on perennial sweet peas and orache. This photo was taken this morning; this is my favourite season for orache as the colours of the seed pods really sing out. I'm about to have another little break from work, a holiday-at-home where I can potter about the veg garden, tidying and mulching and preparing for colder months and, I hope, more regular blogging! Today was the first of those days; I was able to spend some time giving the veg a good watering and noting what needs to be done - quite a lot, as it happens... who says that spring is the busiest time for gardeners? ... and are still fruiting today, with more to come. Three months of raspberries. Result. But who can tell whether this is due to my "experiment" or the bizarre weather we've had this year? Either way, I'm happy. I love spaghetti squash - so simple to prepare and so delicious in a squashy-marrowish way. I like them cut in half, microwaved, seasoned and served with lashings of butter over the forked flesh. Unfortunately for me I started a fat free slimming diet last week so I hope they store well - it will give me something to look forward to! I won't be posting or gardening tomorrow; rather excitingly, I'm starting a part-time garden design course at Capel Manor. I'll be studying horticulture in the mornings and drawing and design after lunch. Combine that with a stroll around the college gardens and I couldn't think of a nicer way to spend my Fridays (rush hour traffic excluded). I'm going to gloss over the rather glaring omission of any recent blog posts... I've had a short holiday at home during which I redecorated my living room and I've been making sloe vodka and rosehip cordial after foraging walks on Hampstead Heath. I've hardly been in the veg patch other than to pick the still prolific raspberries and beans. In short, I've been enjoying a little bit of belated summer (while it lasts). Despite nights that are getting chillier, the warm sunshine during the day is acting like a tonic on my plants as they're suddenly doubling in size or flowering madly in an end of season rush. Thus, this morning, I opened my balcony door to see that (finally) my Sicilian White Courgette has a male and female flower open at the same time! The netting presents a challenge for the bees to get through so, small paintbrush in hand, these have been hand-pollinated. This is a beautiful pale courgette which is absolutely delicious finely sliced and lightly fried in olive oil, adding a touch of finely chopped chilli and lemon zest in the last few minutes, before tossing into pasta of your choice. (I like pappardelle, the wide ribbon pasta which soaks up all the juices.) I keep it simple but I've seen recipes where pine nuts are added, or a parsley/breadcrumb topping added. In any case, I always throw a good handful of parmesan onto it before serving, either thinly sliced or grated. 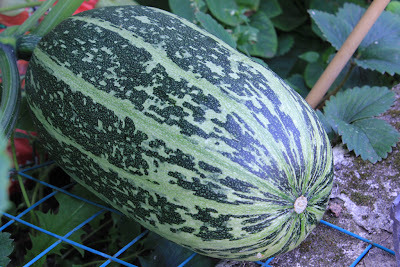 It's another beautiful sunny summer's day here in London so, toodle-loo, I'm off to tackle the weeds in the veg garden and see how big my veg patch spaghetti squash is getting today (and how many fruits it's now bearing! Yum!). Lemon curd to me is as Hunny to Winnie-the-Pooh - once there is a jar in the house, one little taste just won't do. When the Veg Patch was started four years ago, a group of us thought that some lemon trees would be a novelty for the children. Despite the advert's claims, they don't fruit in this country (although, perhaps in a greenhouse?) but the leaves have a lovely citrus scent when crushed. The trees duly arrived, folded into their boxes. Not an auspicious start and the ensuing winters fairly well did them in. There's one tree left which I brought up to my balcony last winter for shelter. It's now on the stairwell, by a window which acts as a greenhouse; because I pass it every day, it's watered and tended regularly and has slowly recovered. During the last week, my efforts started to pay off as it produced lots of fresh new leaves. A couple of days ago, I noticed tiny flower buds! Ah, exciting times. I doubt these will ever make useable lemons but refocussing on the lemon tree reminded me that I hadn't made any lemon curd for a while. All you need are lemons, eggs, sugar and butter - and a couple of jars. I always have these ingredients to hand so, an hour later, I was tucking into lashings of lemon curd atop a hunk of freshly baked bread... which, of course, was photographed after one bite! Having honed my recipe from one my Mum makes and Heston Blumenthal's filling for a lemon tart, I've just realised it's very similar to Delia Smith's recipe but without the extra cornflour she uses. I feel that the curd should set on its own without extra thickeners and I imagine the cornflour would make it unpleasantly thick, like a lemon meringue pie filling. So here's my combination of the two, for folk who like a good sharp/sweet bite to their lemon curd and fancy making some at home. It's really very easy and much nicer than shop-bought and without the preservatives or thickening agents. 3 small or 2 large clean jars. Take the jars out of the oven and get a clean bowl and plastic sieve ready. Pour the curd into the sieve and, with the bottom of a ladle or a wooden spoon, gently stir the curd through the sieve to the bowl below. This removes any cooked egg whites and pieces of zest (I like my curd smooth). Ladle the curd into the jars. Put a sprig of lavender (optional) on the surface of the jars being stored and quickly put the lid on while the curd is still hot. As it cools, the air in the jar will contract, giving a nice tight seal to the jar. Why the lavender? I've read that it's commonplace in the South of France to place a sprig of lavender on home-made preserves where its anti-bacterial properties will prevent any mould forming on the surface. (Thank you Karen, writing for Garlic and Sapphire blog.) Lemon curd won't be around long enough in my house for this to happen, but it looks pretty - especially if you're giving the jars as a gift.